I am celebrating the Fourth this year while in London. I’ve been away from the US a number of times on the Fourth of July, and I am always struck by the influence our independence and love of freedom has made on the rest of the world. This year, however, I think it is a good day to ponder how we are now squandering the sacrifices of so many who gave their all that we could be an example of all that is good and right. I truly love my country. Yet, I have never feared for her as I do today. We stand by in abject silence as the true values of our great nation are being extinguished one by one. 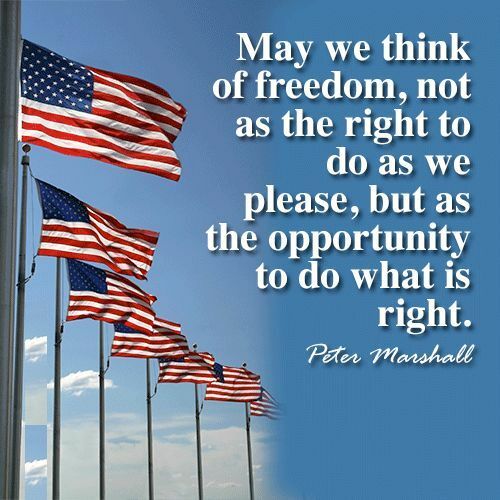 This entry was posted in News & Views, Quotes and tagged doing what is right, example, extinguish, fourth of July, Independence Day, justice, liberty, nation, opportunity, Peter Marshall, sacrifice, silence, values on July 4, 2017 by Ray Buchanan.